Several biographies of JRR Tolkien have been written since the author’s death in 1973. Tolkien himself was a very private person and extremely wary of biographers. He often refused to provide biographical information for those wishing to do so. Tolkien much preferred a biography to be about an individual’s work…his books, his scholarship, and his studies. The only “authorized” Tolkien biography was written by Humphrey Carpenter, a family friend, and published in 1977. Several “unauthorized” biographies have also been published, including those by Daniel Grotta, Leslie Ellen Jones, Anne E. Neimark & Brad Weinman. Uncounted books of Tolkien study and criticism also exist, dealing primarily with The Lord of the Rings, Middle Earth (Tolkien’s created world), The Hobbit, and Tolkien’s Anglo-Saxon and linguistic studies. John Ronald Reuel (JRR) Tolkien was born on January 3, 1892 in Bloemfontein, South Africa, to English parents Arthur and Mabel Tolkien. At three he returned, with his mother and younger brother, Hilary, to England, where they settled in the quiet Warwickshire village of Sarehole. Shortly thereafter, Tolkien’s father died in South Africa, so the family remained in England. During his middle teenage years, while a student at King Edward VI school in Birmingham, he began to study the Anglo-Saxon and Welsh languages, under the tutelage of one of his teachers, George Brewton. In his 16th year he met Edith Mary Bratt, who also lodged at his boarding house, and fell in love with her. Religion became a stumbling block for them, as Tolkien was Catholic and Edith Mary’s family was protestant. When her aunt and uncle guardians caught wind of the romance, Mary Edith was “exiled” to a country house and forbidden to see Tolkien. 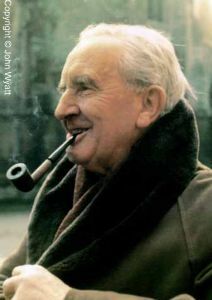 Tolkien attended Exeter College, Oxford, beginning near the end of 1911 as a “Classical Exhibitioner in Residence”, a rather verbose name for a student who studies languages, literature, mythology, and the classics. By 1915, when Tolkien finished his degree at Oxford, World War I had exploded throughout the continent. He enlisted, and was commissioned to the Lancashire Fusiliers. Early in 1916, during a short leave before being shipped to the front, he married his childhood sweetheart Edith Mary Bratt. Tolkien was deployed to the western front and his regiment took part in the Somme offensive. Tolkien survived the slaughter unscathed, but shortly afterward contracted “trench fever”, something very similar to typhus. He was returned to England in November 1916, and spent several months in and out of the hospital. Tolkien never returned to active duty. It was during this long convalescence that he first began to write – in notes, often on the backs of envelopes – some of the tales of Middle Earth. Many of these tales later became part of The Silmarillion, published several years after Tolkien’s death. These tales are of the early years of Middle Earth, long before the events that take place in The Hobbit and Lord of the Rings. Upon his return to health, the Tolkiens took up residence near Christ Church College. Tolkien soon landed a position as a junior editor for the Oxford English Dictionary. During this period he also began to seriously develop the languages of the elves of Middle Earth, languages based in Anglo-Saxon, Welsh, and Finnish roots. He also continued to work on his early Middle Earth tales. In 1921, Tolkien was offered a post at the University of Leeds, which he accepted. During this tenure, he collaborated with E.V. Gordon on an acclaimed translation of the Middle-English poem Sir Gawain and the Green Knight, published by Oxford University Press in 1925. He remained at this post until 1925, when he took a position as Professor Anglo-Saxon at Oxford University, a position he retained until his retirement in 1959. Tolkien was not a prolific writer of scholarly articles, though he was very influential in his field. His 1936 lecture and defense on the Old English epic Beowulf, entitled Beowulf: The Monsters and the Critics is still considered the gold standard of Anglo-Saxon scholarship. His 1939 lecture “On Fairy Stories” is similarly considered an important piece of scholarship. It put forth ideas on the building of mythologies and fairy stories that were later applied to the writing of Lord of the Rings. During the early 1930’s he also became involved with the creation of a rather loose group of individual scholars and friends (generally Oxford-affiliated) calling itself “The Inklings”. The members of this famous group included Tolkien, C.S. Lewis, Charles Williams, and several other well-known scholars and writers of the day. They usually met in pubs, drank, conversed, and read each other samples of their writings or current projects. During the mid-1930’s he wrote a story to read to his children, drawing on his extensive knowledge of mythology and folk-tales, as well as his own created mythology, he created the story that would later become known as The Hobbit. A friend who knew of the manuscript persuaded Tolkien to submit it to a publisher, and in 1937 George Allen & Unwin, a small London publishing house, published The Hobbit. Some time during the late 1930’s Tolkien began writing the opening chapters to what would later become Lord of the Rings. His publisher was encouraging, hoping for a sequel to build on the success of The Hobbit. What he received instead was a sprawling epic saga that Tolkien worked on intermittently for the next fifteen years. He drew heavily upon his previously-built “mythology” of Middle Earth as inspiration and background for the story. Tolkien himself famously said “this tale grew in the telling”, because when he began it he had absolutely no idea where it would take him. Lord of the Rings was first published, in three separate books, between 1954 and 1955. It received a wide mix of positive and negative criticism, selling well above the publisher’s very modest expectations. It did not become a mass commercial success until the publication, more than ten years later, of affordable paperback versions. The publication and cult popularity of Lord of the Rings took Tolkien by complete surprise. He soon found himself a celebrity, invited to speak, accept awards, and give interviews. The life of a celebrity did not suit Tolkien, and he increasingly withdrew from this public life throughout the remainder of his life. He wanted to return to his early writings on the background of Middle Earth, to prepare for publication what would later become The Silmarillion and public life robbed him of the necessary time and concentration. Prior to his completion of The Silmarillion for print, however, Tolkien passed away on September 2, 1973, of pneumonia. After his death, his youngest son Christopher took up his father’s torch and finished preparing The Silmarillion’s manuscript for print. The Silmarillionwas released in September 1977 to commercial success.